Why did you write Ride High Pineapple? I was born with a rare craniofacial syndrome, and my two eldest children also have the syndrome. Growing up I was told that Graham Kennedy, an icon on our Australian TV screen, also had my syndrome, but no one else I knew did. When I was 10 years old I saw one other child with the syndrome but never spoke to them. I had a tough childhood with bullying, horrific operations and feeling like a freak. I also had amazing friends and family who loved me and wanted me to have a great life. When my children were born with the syndrome, the internet had begun and I went searching for others. I found an American group on Yahoo and it was like the devil had been lifted off my shoulders. I had finally found my tribe. The invention of Facebook has since enabled those of us with the syndrome, to unite, from all over the world. Since having my children I have wanted to write a book where the main character had my craniofacial syndrome, as there was none. I had tried to write the story for many years but it wasn't the right time, and I never finished the manuscript. When I read Wonder by R J Palacio, I became even more determined to write the story. I enjoyed reading Wonder and I thought it raised a lot of awareness about craniofacial syndromes and facial differences; it showed how siblings and parents are affected; the bullying people living with craniofacial syndromes go through, and how cruel and nice other children can be in the school environment. I didn't want to write another Wonder. I wanted to write my own unique story. When you read Ride High Pineapple you will see it is a very different story, with an Australian flavour to it. When I was telling people about Ride High Pineapple as I was writing it, many suggested that I make the story not too focussed on the face, but make it so anyone who feels different will benefit from reading it. I took that advice to heart so didn't put too much background information about the syndrome in the story, just enough so the reader could understand what Issy was living with. I also added mental illness to Issy's character and women's skateboarding. These two themes were both significant. Myself and my daughter have anxiety and depression, and my daughter was into skateboarding at the time I wrote it. The story is about Issy Burgess who is in Year Nine at high school. She's been through a lot medical wise with multiple surgeries on her face, but her face is changing back to how it used to be before her last operation and she is being called 'fish face', 'froggy eyes' and other cruel names, by one particular girl, Tia. In her diary, Issy calls Tia, The Beast. Issy also has a best friend, Tilly, who has known her since they were small. The story is about how Issy tries to ignore the bullying through her love of skateboarding but how it eats her up inside by doing so. It is at the skatepark that Issy meets her crush and they become friends. Issy wants more. I won't tell you what happens with that part - you'll have to read it and see! Issy is a three dimensional character, so her diary deals with her search for her identity, severe anxiety in a variety of situations, and extreme jealousy of a new girl, coming into her friendship circle with Tilly. You could say Issy is your fairly typical teenager in that respect. Tilly is faithful in her friendship towards Issy and she reminds me of my best friend growing up. The other major part of the story is Issy's growing ability in her skateboarding and what happens with that. Also the introduction of Issy's skateboarding coach who acts as a mentor to help her overcome her foes. Why is the book called Ride High Pineapple? Ah, that's a good question. 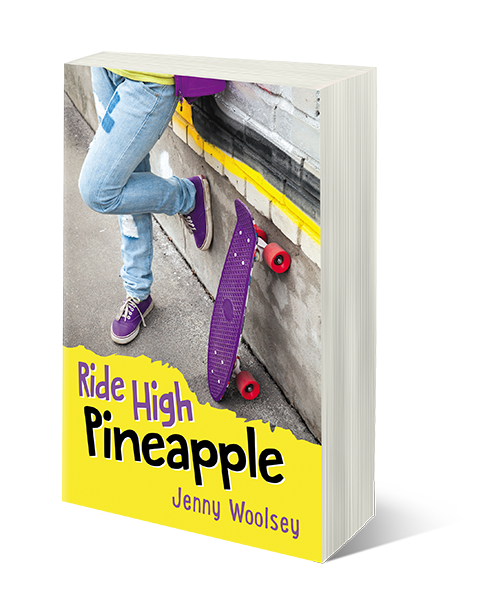 The story has a few meanings which become clear as you read the book, but to put it simply - Ride High - is for Issy's skateboarding, and her ability to overcome her struggles... and Pineapple is from the analogy she learns from her skateboarding coach.You'll have to read the book to see what that means! Apart from the general plot, what makes this story different from Wonder by R J Palacio? 1) The syndrome is different. Wonder's main character Auggie has Treacher Collins syndrome, my main character, Issy, has Crouzon syndrome. 2) It is written by someone who has grown up with a craniofacial syndrome. Issy is a combination of myself and my eldest daughter, who also has the syndrome. 3) It is set in Australia. 4) Issy is a teenager in high school. Auggie was in primary school. 5) Issy is a girl, Auggie a boy. 6) Ride High Pineapple is written as a diary. 7) Issy suffers from severe anxiety and depression. Auggie and loves skateboarding. Auggie is into Star Wars and the moon. 8) There are teenage girl issues in Ride High Pineapple e.g. hair colouring, friendship ups and downs, a crush, jealousy, socio-economic differences. 9) The Starlight Foundation are featured in the hospital scene. 10) It features poetry that Issy has written throughout the story. I must also mention that the Children's Craniofacial Association who promote Wonder and the #choosekind campaign, has written the foreword and endorsed Ride High Pineapple. The reader will be totally absorbed in a raw honest story. They will experience a range of emotions as they turn the pages. The reader will also know how it is to be like a pineapple! Where can people buy Ride High Pineapple? Ride High Pineapple is available as an ebook and a paperback. It can be purchased from many online bookstores which are listed on my website, and from me directly, via my website.